Ronnie O'Sullivan became the first man to reach 1,000 career centuries as he sealed a 10-4 win over Neil Robertson in the Players Championship final. The five-time world champion went into the match needing three more centuries to reach four figures. He made two in taking a 7-2 lead at the end of the first session in Preston and achieved the landmark with a 134 to retain his title. Stephen Hendry (775) and John Higgins (745) are the only others to pass 700. In trademark O'Sullivan style, he paused and calmly switched his cue to his left hand before rolling in the milestone-clinching red. His achievement was raucously celebrated by the Preston Guild Hall crowd, which provided sustained applause as he cleared the table to make history. O'Sullivan's clearance of 141 would have earned him an additional £5,000 for the tournament's highest break - denying Robertson that accolade - but the cue ball trickled into the middle pocket. It was O'Sullivan's 35th title - his first came at the same venue in 1993 - and he said: "It's a special moment with the crowd. You never know what to expect and I've never had that before, everyone cheering every ball as it was going in towards the end." Finishing in the Australian accent he has frequently adopted this week, which he revealed was due to watching a large amount of that country's TV recently, he said: "That was fantastic, mate, and something I'll remember for the rest of my life." The 43-year-old was in masterful control from the moment Robertson went in off after potting the blue in the early stages of the opening frame. He was not even disrupted by twice having to tell referee Terry Camilleri that the black had been placed back on its spot incorrectly in frame two. 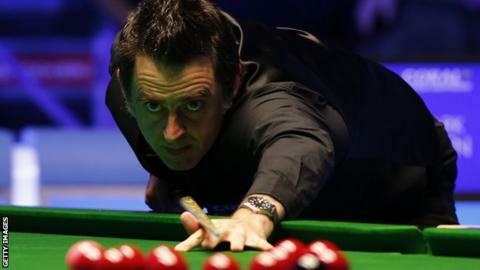 Robertson scored only 35 points in the four frames before the mid-session interval, with a highest break of 25. In his 50th career final, O'Sullivan looked set to make it 5-0 when on a 50 break, only to miss a red into the centre, banging the table in frustration. A 65 helped Robertson to chalk up his first frame. But O'Sullivan swiftly took the next with a magnificent 116, his 50th century of the season, while in frame seven a three-ball plant led to a 56 and a 6-1 advantage. Robertson made a 78 to win frame eight, the only one of the session in which O'Sullivan did not make a 50 or more, but the Rocket moved to within one of the landmark with a superb 105. When the match resumed in the evening session, Robertson made a 120 total clearance with his 63rd century of the season in the opening frame. Having made a 90, which ended with a difficult missed red along the cushion with the rest, O'Sullivan fittingly coincided the landmark with the end of the match.